Calling all Atlanta brides! 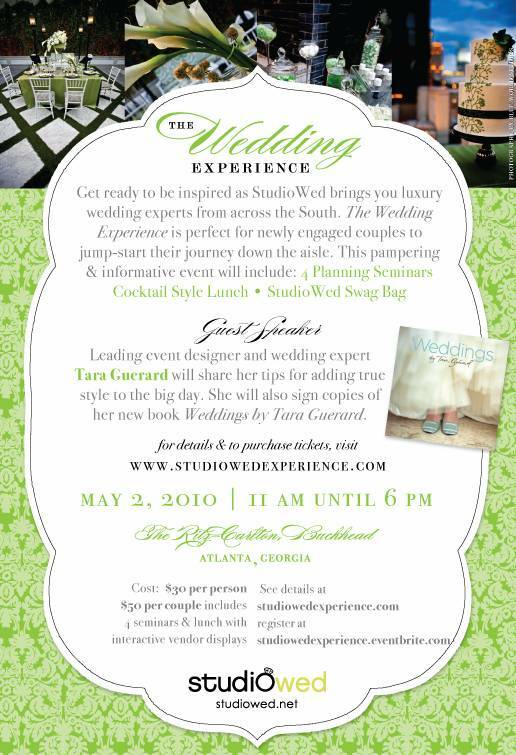 Are you ready for “The Wedding Experience?” This one-day event produced by StudioWed will bring together regional wedding experts and area vendors with engaged couples in Atlanta for an afternoon of inspiration. The event, which will guide couples in planning their perfect day, will feature seminars, guest speakers, an interactive lunch and cocktail mixer. Featured presenter, Tara Guérard of Charleston and New York- based Tara Guérard Soirée will share her behind-the-scenes tools and tricks to making your event memorable. Guests can commemorate the day with signed copies of her new book, Weddings by Tara Guérard. For more information or to purchase tickets to the event, click here.